In a pan, add the oil and onions. Sautee onions on a medium heat until softe. Then add mushrooms, garlic, butter, salt and pepper. Cook until mushrooms are soft. Add pasta and parsley/green onions. Combine well. 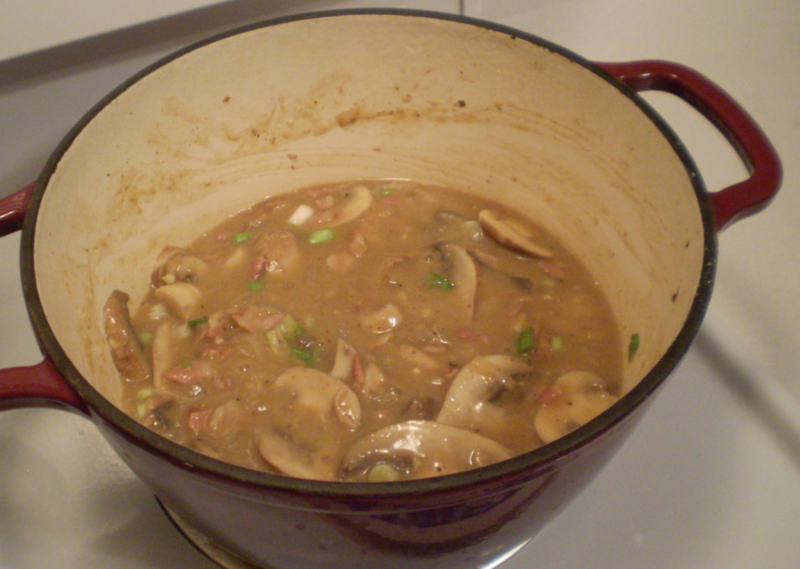 If the pasta and mushroom mixture appears dry, gradually add some of the reserved pasta water. The pasta and mushrooms should be coated in a glossy sauce. Once well coated, serve and garnish with parmesan. Makes 2 to 3 servings. In a pan, heat the olive oil. Once hot, add pancetta. Cook pancetta until crisp. SUGGESTION-a: a large amount of oil will render out of the pancetta. Push the pancetta to one side of the pan, tip the pan so the oil collects onto the other side of the pan. Use a couple of paper towels to soak up this oil. See diagram. Add mushrooms, garlic and pepper, and a couple of tablespoons of the pasta water, and a tiny sprinkling of salt. Be sparing with the salt as the pancetta and parmesan are quite salty. Once the mushrooms are cooked, add the pasta and combine. Remove pan from heat. SUGGESTION-b: place the pan onto two trivets such that there is a gap between the pan and the counter top. See diagram. Add the remaining pasta water, and then sprinkle the parmesan cheese on top of the pasta. Add eggs while the pasta is still warm (but not being directly heated). This will prevent the eggs from scrambling. By applying suggestion-b and adding the parmesan cheese, this circulates and cools down the heat of the pan, helping to further reduce the eggs from scrambling. Stir well. Garnish with more parmesan cheese if desired. 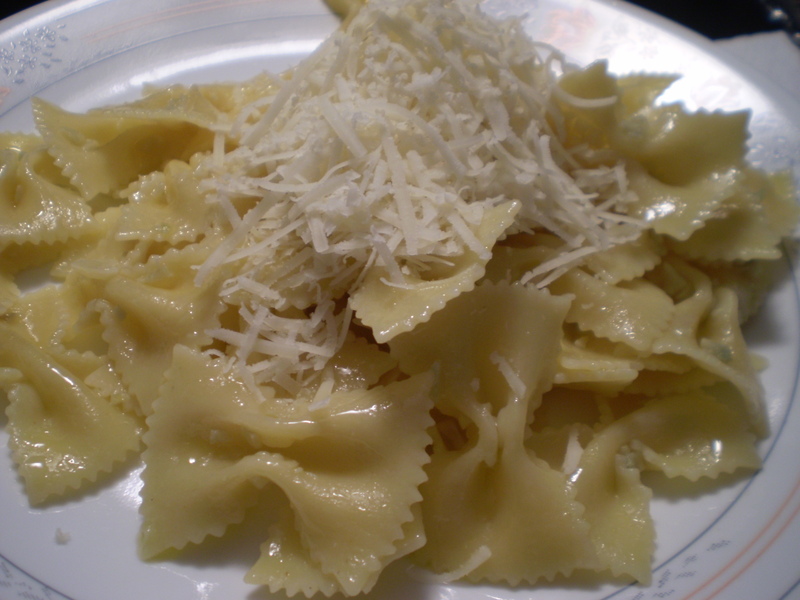 Bowtie pasta mixed with garlic and olive oil, garnished with freshly grated kefalotyri cheese. My apologies for the long absence in new postings. School has been very busy. But here’s a very simple and delicious recipe for garlic lovers! 1. 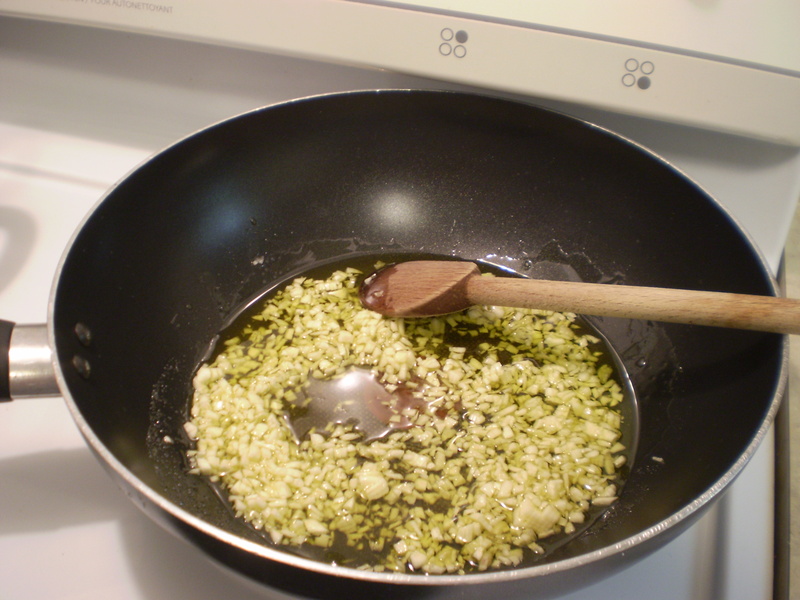 In a large pan, cook the garlic with olive oil for approximately 10 minutes on medium heat. 2. Once the garlic is cooked, add in the drained pasta and pasta water. Combine well. 3. Serve, and if desired, sprinkle each serving with a generous amount of kefalotyri cheese. Minced garlic gently cooking in olive oil. 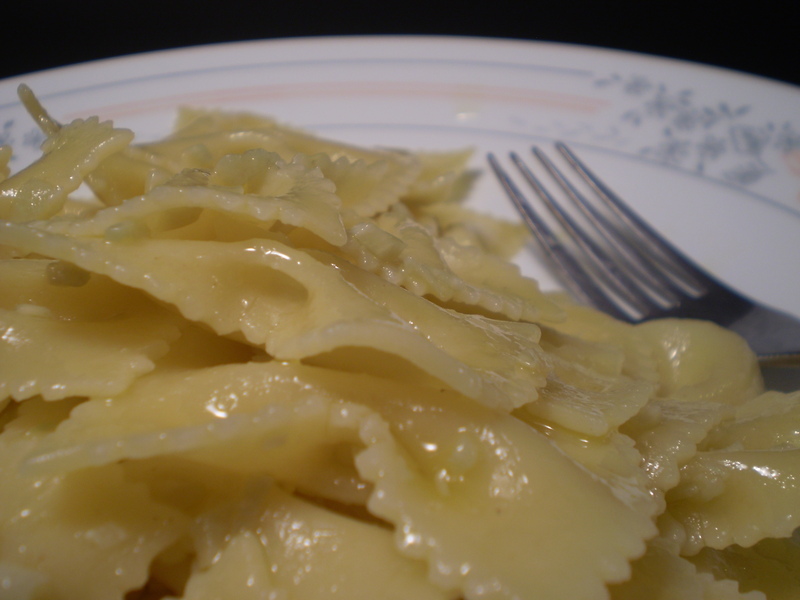 Bowtie pasta with garlic and olive oil. 1. Cook pasta as instructed. Drain pasta well when done. 2. While pasta is cooking, in a large sautee pan, add in oil, garlic and onions. 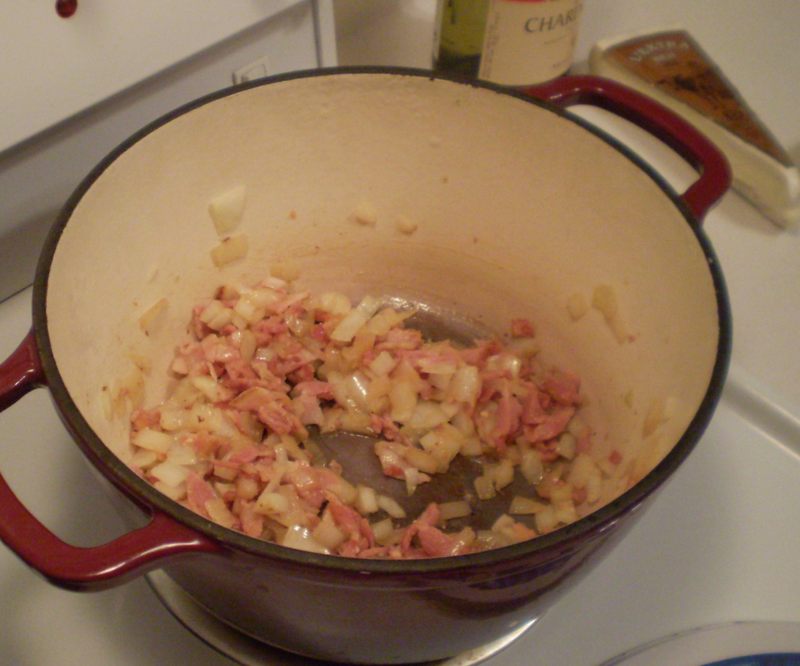 Cook until onions are soft (about 3 minutes) on medium heat. 3. Add in chicken bacon. Cook for another 5 minutes or until chicken bacon begins to brown. Onions and chicken bacon sauteing in a pan. 4. In a bowl, add parmesan cheese and eggs. Beat. 6. By now the chicken bacon and onions should also be done. Turn off burner but do not remove pan from burner. 7. 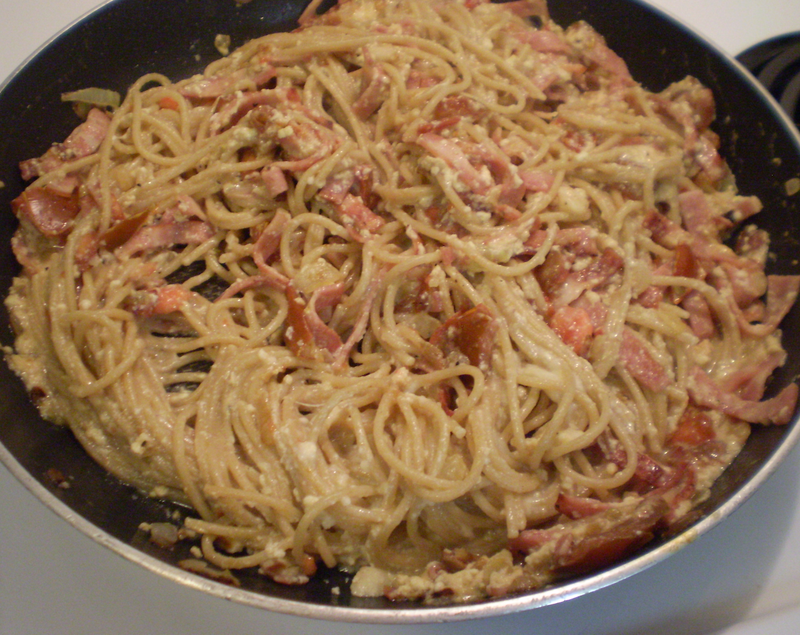 Add pasta, egg mixture and tomatoes to sautee pan. Mix well. There should be enough residue heat from the burner to warm the pasta and sauce. 8. Season with sea salt and freshly cracked pepper. 9. Dish out and garnish with cilantro or parsley. *Other vegetables that go well with carbonara include sliced cremini mushrooms, asparagus, string beans and/or zucchini. 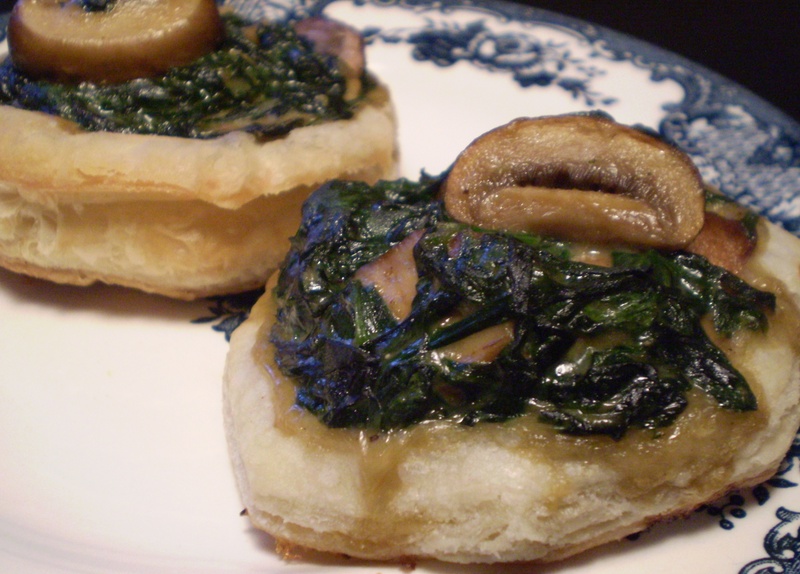 Flaky tender pre-made pastries topped with homemade spinach and mushroom filling. 1. 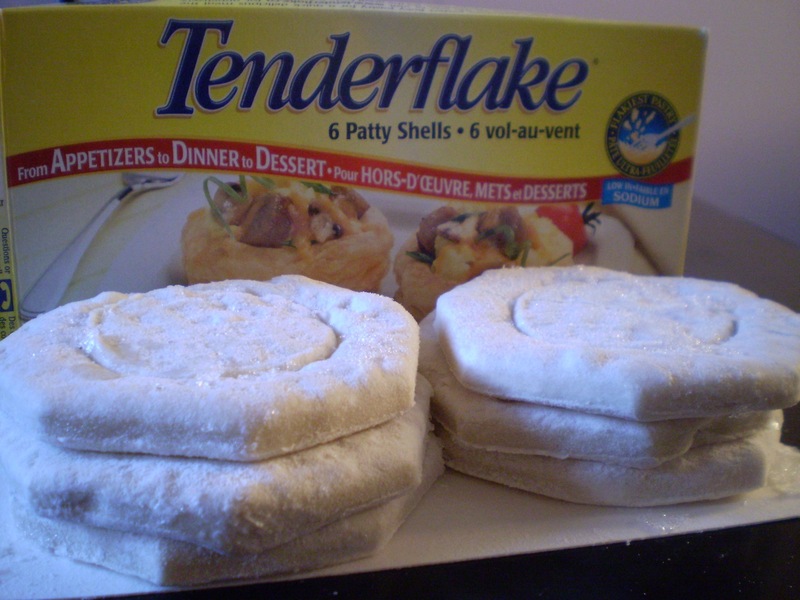 Bake the Tenderflake pastries for half the recommended time. 2. Once ready, remove from oven and let cool for a couple of minutes before adding the filling. 3. After the pastries have been filled, they will continue baking for the remaining time. Six Tenderflake pastries, baked for half the recommended time. 4. For the spinach mushroom filling, add to a hot pan the butter, oil and garlic. 5. Once the garlic is brown, add in the mushrooms and turn down to medium heat. 6. 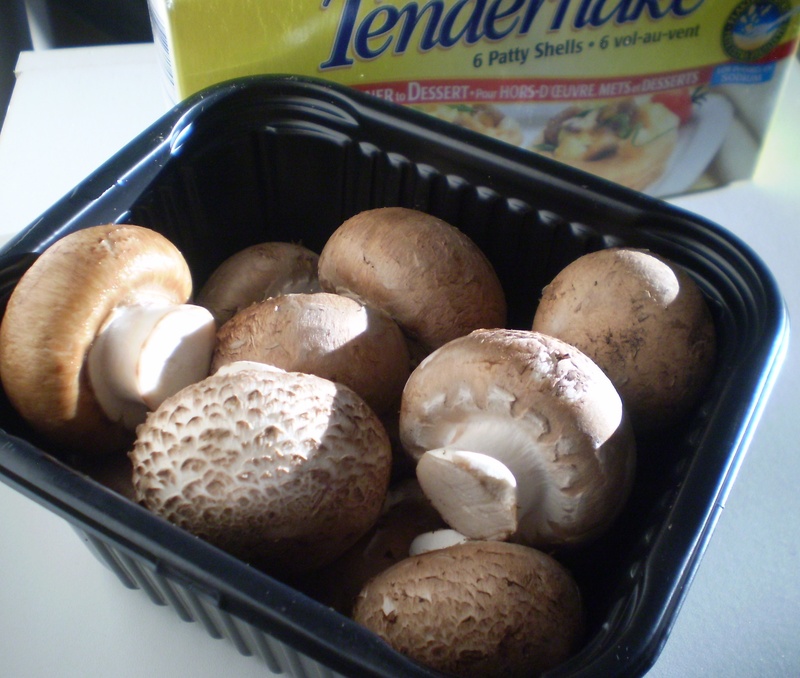 Sprinkle in a little salt over the mushrooms and cook until the mushrooms begin to soften (about 3 minutes). 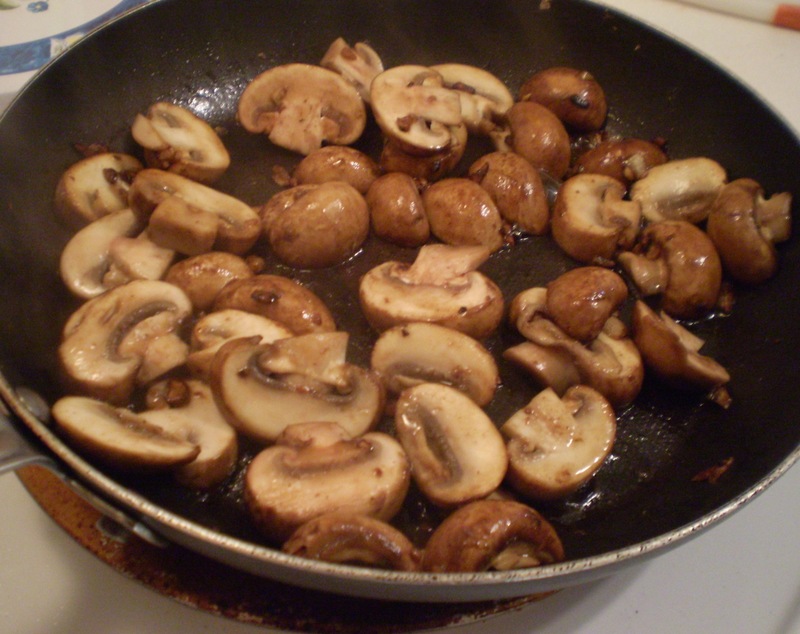 Cremini mushrooms with chopped garlic sauteing in olive oil and unsalted butters. 7. Add in the flour evenly over the mushrooms and cook the flour for a few seconds (this removes the raw taste of the flour), then pour in the milk. Sauted mushrooms with flour and milk. 8. Once the milk begins to bubble, gradually add in the spinach. 9. 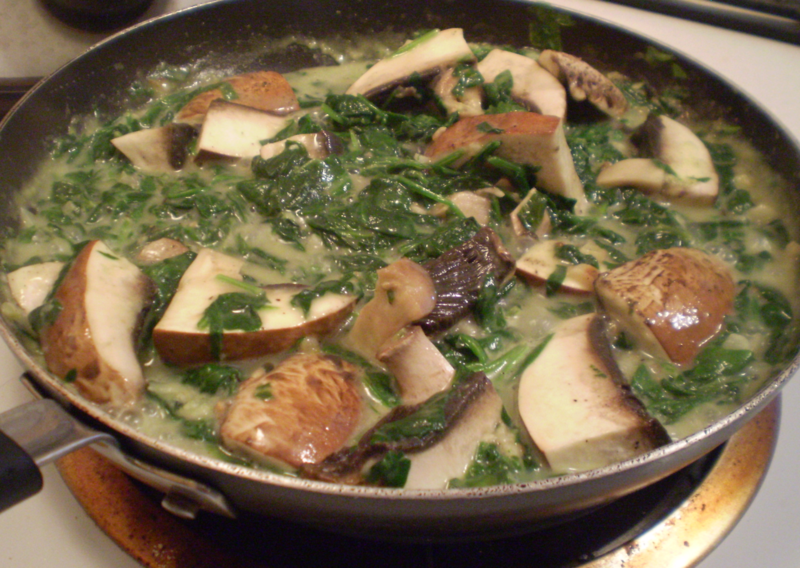 Cook until the spinach has wilted and the mushrooms are completely soft. 10. Add salt and pepper to taste. 11. Remove from heat and let cool. 12. Once cooled add in the parmesan. Combine well. Cremini mushrooms and baby spinach simmering in milk. 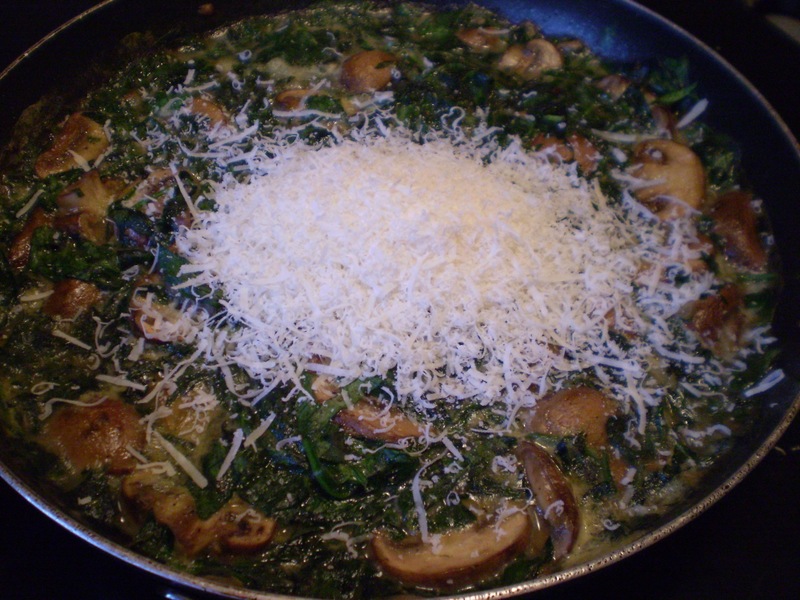 Once the mushrooms and spinach mixture is cool, add in the parmesan. 13. 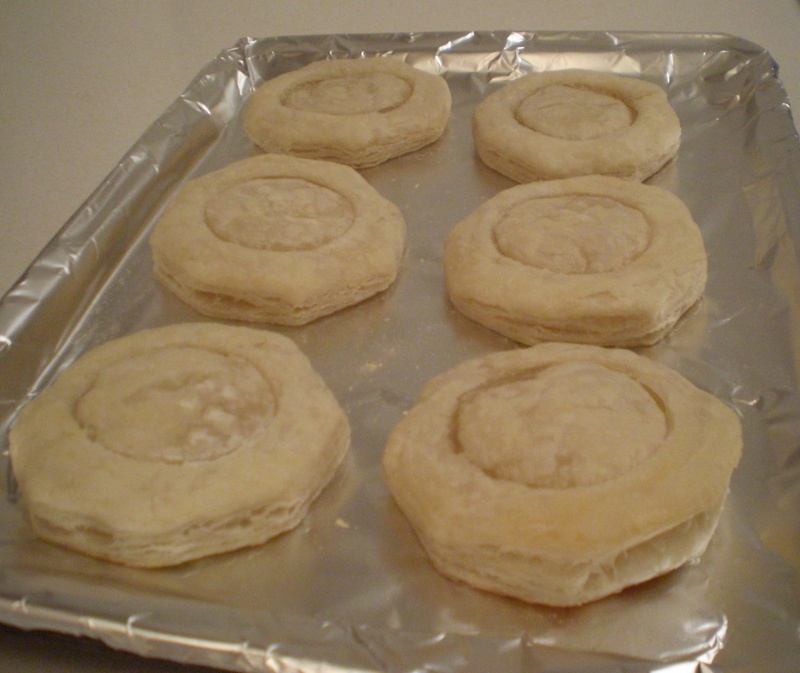 Drain as much liquid from the filling before placing onto the pastries. 14. Scope a generous amount of filling onto each pastry. 15. Place into the oven and bake for the remaining time as instructed on the package. 16. When finished, remove from oven and let cool for a few minutes before serving. 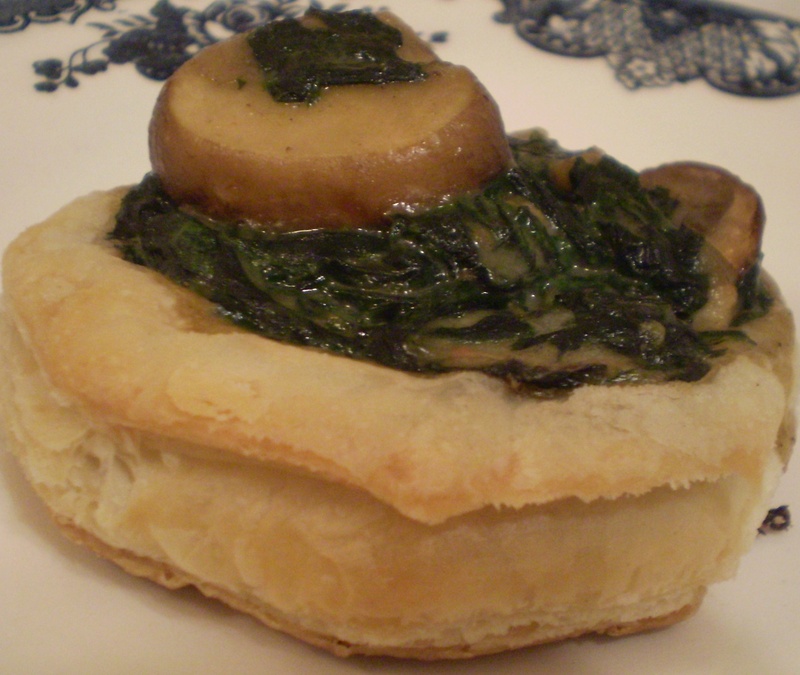 Tenderflake pastry topped with baby spinach and sliced cremini mushrooms. *Alternatively, instead of using the spinach and mushroom filling as pastry toppings, toss the creamy mixture with some cooked pasta and serve hot as a vegetarian friendly entree. 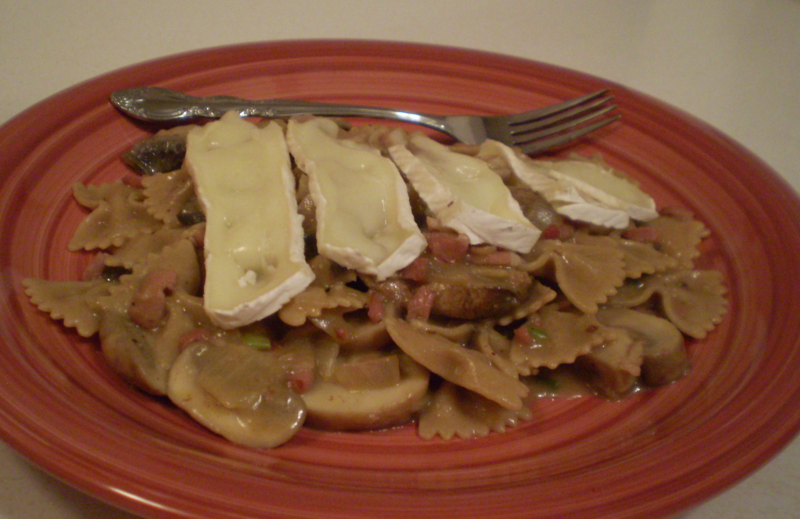 Bowtie pasta in a creamy Chardonnay sauce with bacon, mushrooms and topped with slices of brie cheese. In a large pot, add in the bacon. 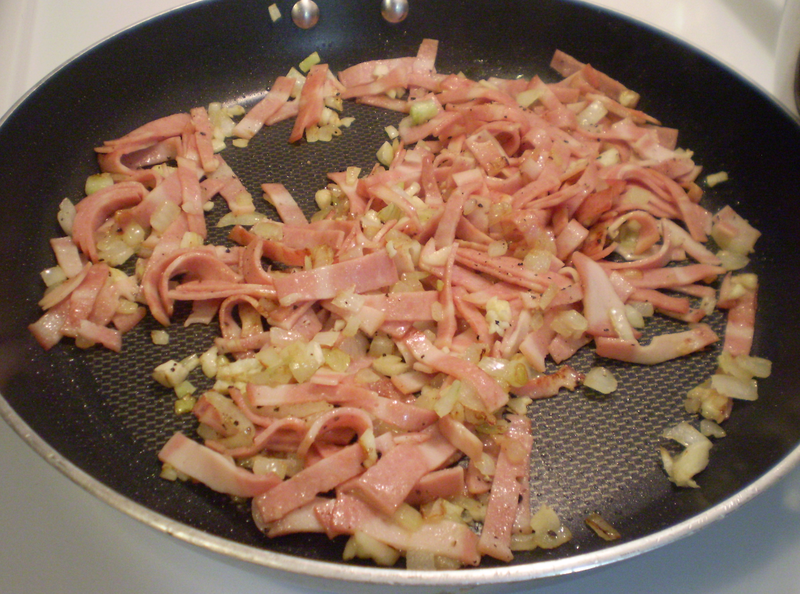 Once some of the fat had been rendered, add in the onions. (Remember to trim the bacon before cooking it. You only want a little bit of fat.) If the bacon sticks to the bottom of the pot, add a few tablespoons of the chardonnay. Cook until the onions are soft, then add in the mushrooms. Mix well and add in the salt, pepper and paprika. Combine well and then add in the remaining chardonnay. 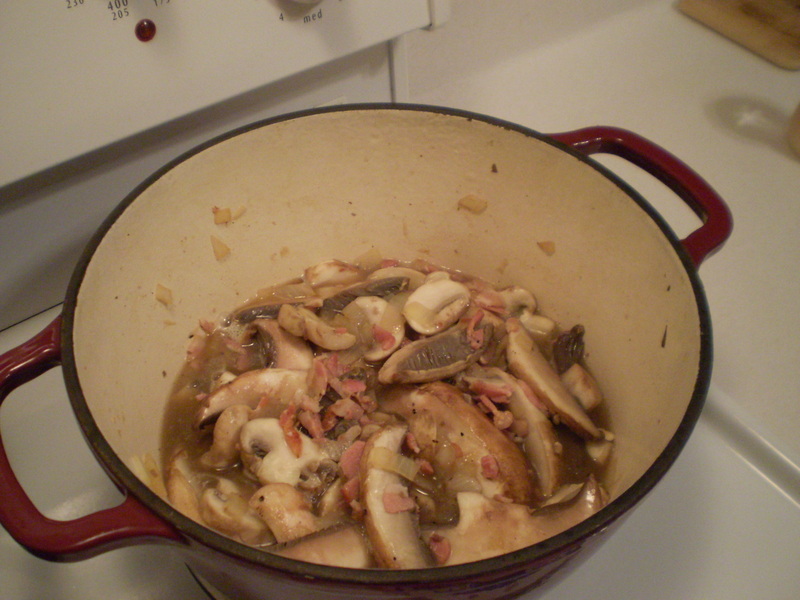 Reduce to a simmer and cook until the mushrooms are soft (about 5 to 7 minutes). 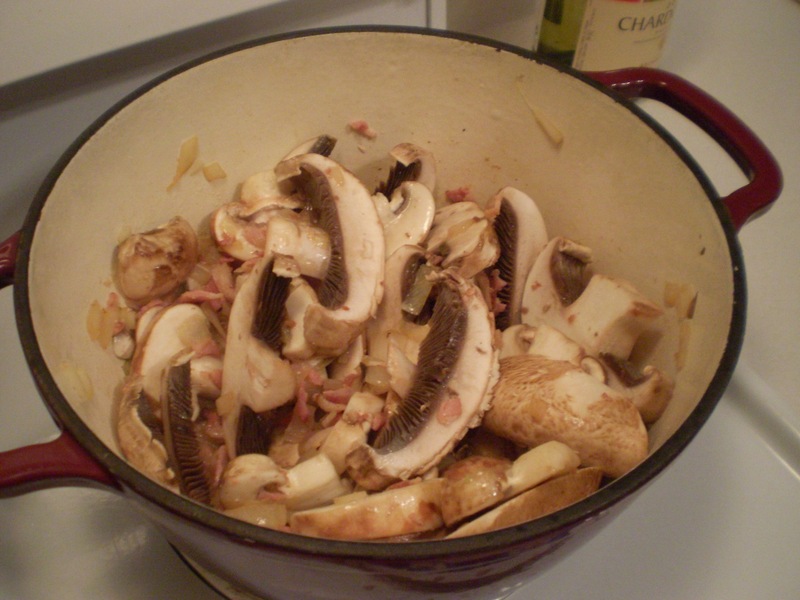 Mushrooms, bacon and onions sauteing. Mushrooms, bacon and onions after sauteing for about 5 minutes. 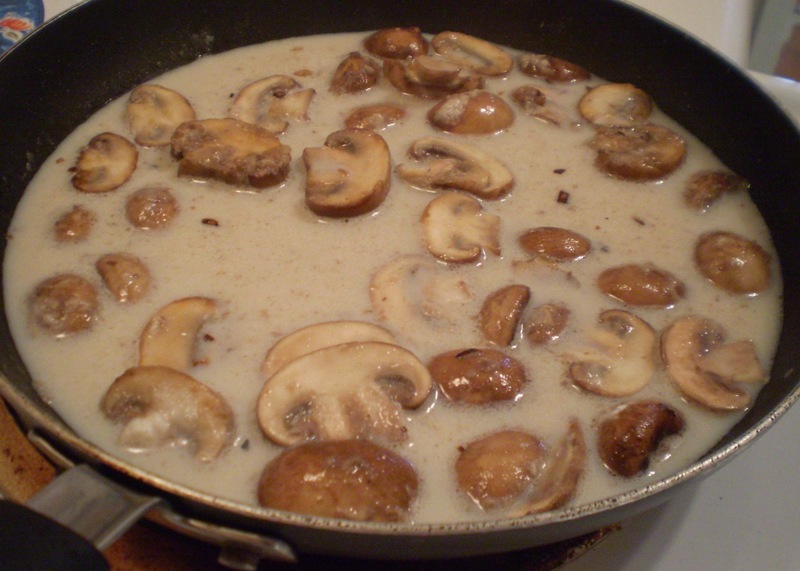 Creamy chardonnay sauce with bacon and mushrooms. On a medium low heat, gradually add in the flour (start with 2 tbsps and add more if needed) and mix. The sauce should thicken momentarily. If the sauce appears watery, add in a little bit more flour. Once the sauce is to an ideal consistency, add in the milk (start with 1/2 cup and add more if the sauce appears too thick) and green onions. When the sauce begins to bubble, add in the pasta. Thoroughly combine so that each pasta is coated with the sauce. 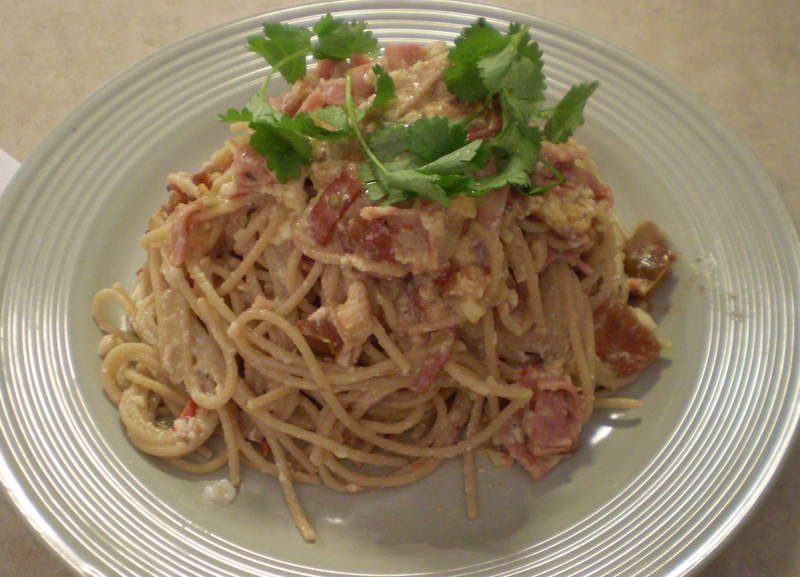 Dish the pasta onto a serving dish and place a few slices of the brie onto the pasta. 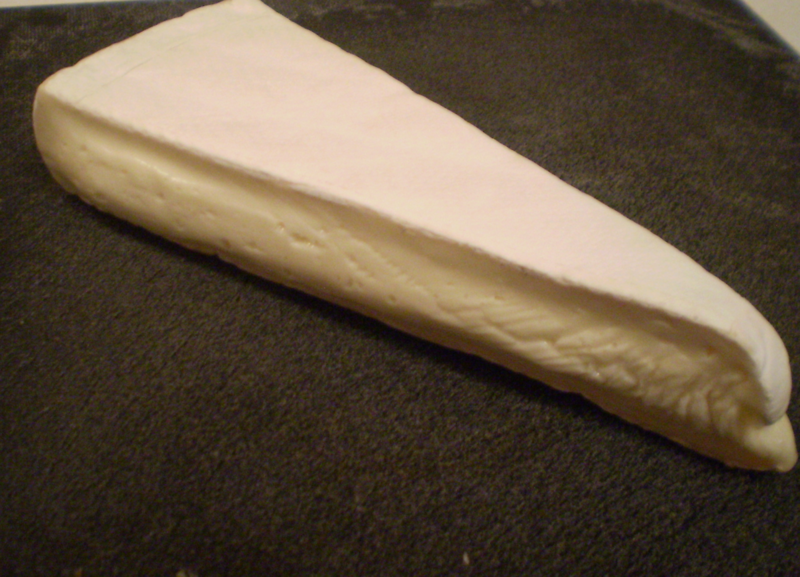 By the time you walk from the kitchen to the dinner table, the brie should be slightly melted. Eat immediately. Serves two. Pair this dish with the same chardonnay used to make the sauce, if so desired. 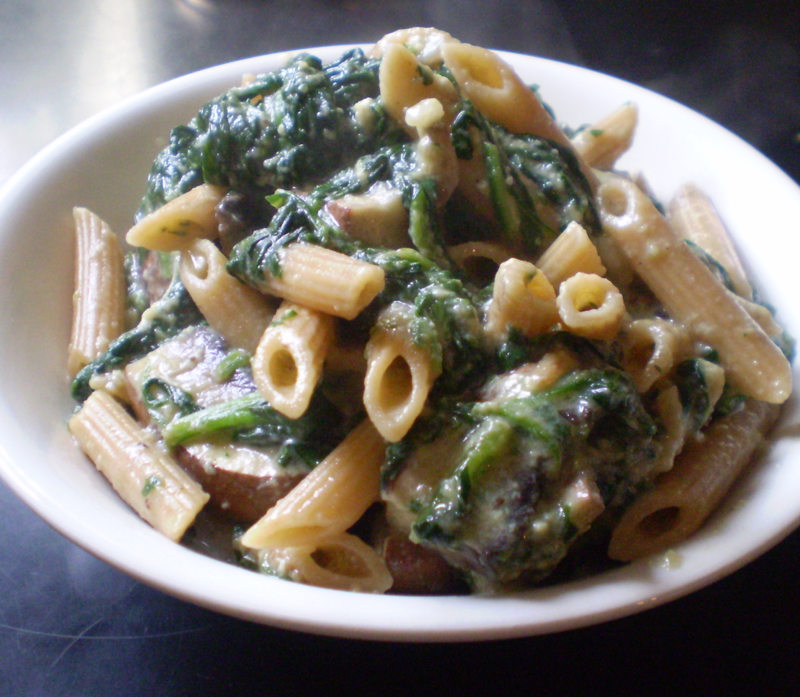 Whole wheat penne in a creamy spinach and mushroom sauce. 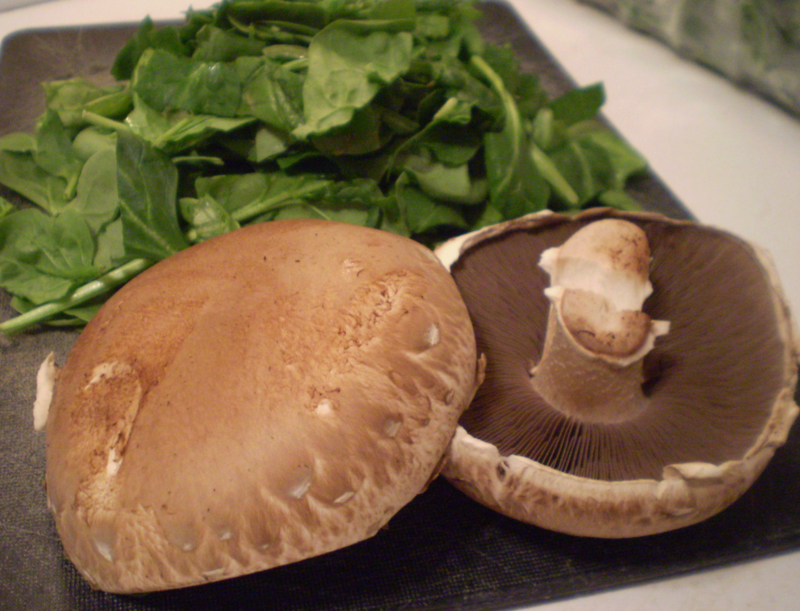 Two Portobello mushrooms and baby spinach. Heat a sauce pan on high. Once hot, add in olive oil and garlic. When the garlic begins to brown, add in the flour. Cook the flour for 20 to 30 seconds, then gradually add in 1 cup of milk while stirring continuously. 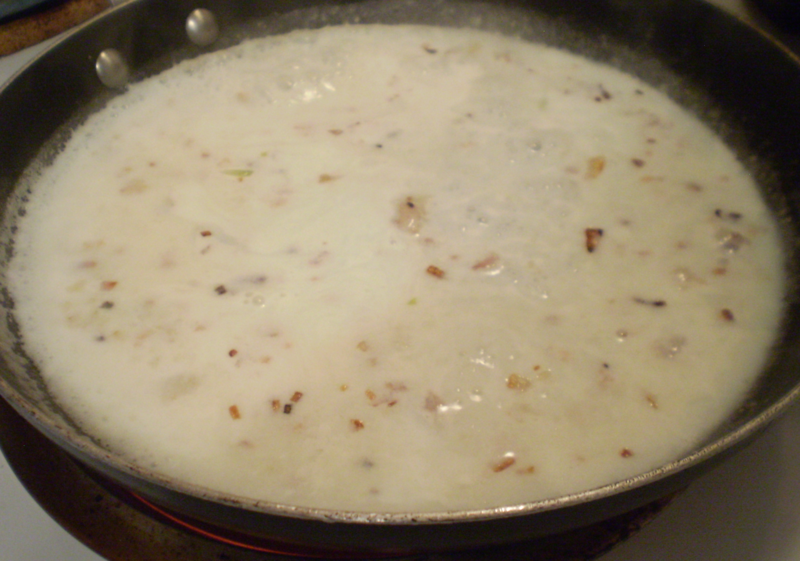 Garlic, flour, olive oil and milk simmering to make base of sauce. When the sauce begins to thicken, add in the spinach. If the mixture appears dry, add in a little more milk. Mix well and turn down heat to medium. 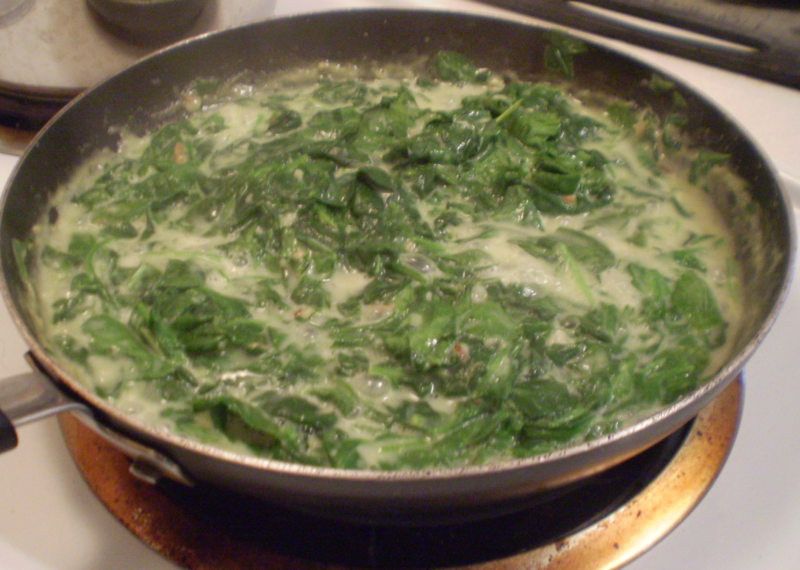 Spinach in a creamy milk sauce. Add in the portobello mushrooms. Mix well. Season generously with salt and pepper. Add in the parmesan cheese. 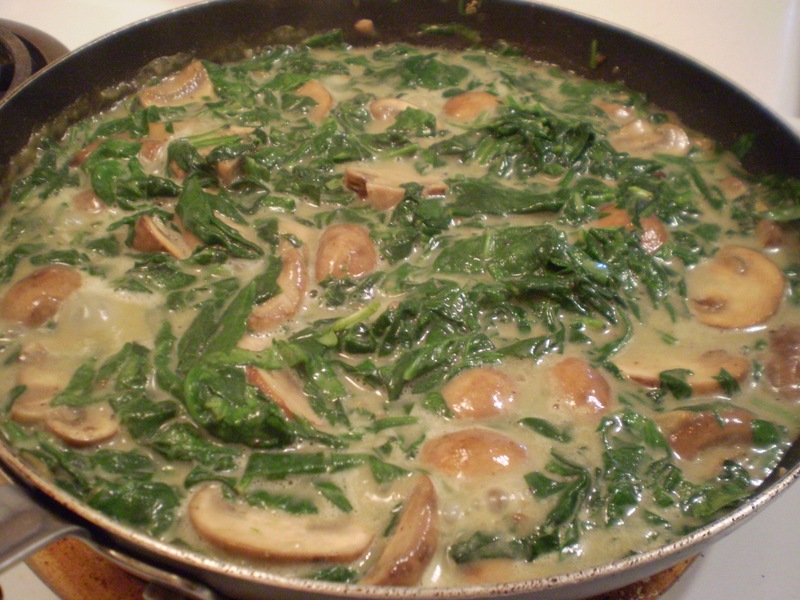 Creamy spinach and mushroom sauce. Once the mushrooms are soft, add in the pasta. Combine well. 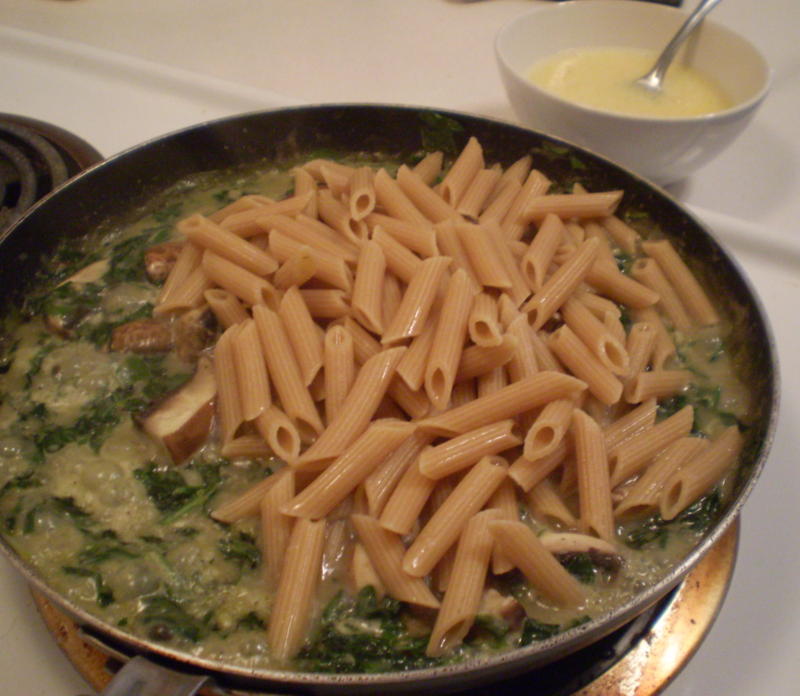 Creamy spinach and mushroom sauce with penne. In a large bowl, beat the egg. While beating, gradually add in a few spoonfuls of the hot pasta water to increase the temperature of the egg without scrambling it. Add enough water such that the egg is hot to the touch. This is known as tempering. It is important to continuously whisk the egg while the water is gradually being added, otherwise the egg may scramble. Remove the pasta and sauce from the direct heat. Add in the warm beaten egg. Combine well. Add more grated parmesan if deserved. Serve immediately.